Home > News > Get one-coin-coffee at Star Bucks Coffee! Get one-coin-coffee at Star Bucks Coffee! Do you know that we can get a coffee refill by 100yen at Star Bucks Coffee in Japan!!? you will get this coupon at the bottom of the receipt. 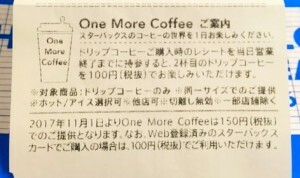 Which means you can get another cup of coffee by 100yen. any shop is okay, same day until 24:00!! show your receipt and get 100yen tall hot or iced coffee! we can get a coffee refill by 50cents!!? Same shop, same size, same cup, if you leave the store, it will be invalid. So, if I want to stay all day at Star Bucks Coffee to study something, read books, chat with my friends, that would be nice!!!! !